Fancy grilled cheeses aren't the only things keeping me going through my final papers. 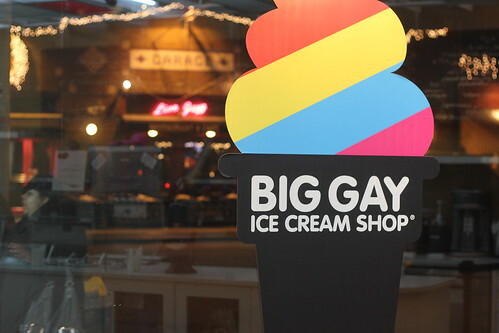 Big Gay Ice Cream opened a new shop within a five minute walk from school. Ice cream sundaes have calcium! That's a nutrient! I stopped by the new shop Thursday evening mainly to taste the week's special flavors: brownie batter and coconut. 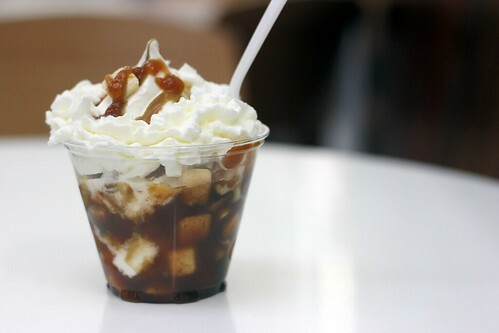 I ended up getting them mixed into a Salty Pimp--which was awesome--but I also got an Apple Gobbler: vanilla soft serve with pie pieces, apple butter and bourbon butterscotch sauce! If you're a fan of fall desserts, this is definitely one to check out. I'll be stopping by again this week as the special flavor is speculoos! I am so excited to hear another shop has opened! The one on the east side was always a challenge to get to. I will need to check it out soon! With the amount of time I spend at Blind Tiger (like today after work), I've no excuse not to Pimp it on the regular. Wow, the Apple Gobbler sounds absolutely amazing!! I need to check this place out!